De tempos em tempos eu preciso restaurar um backup de alguma tabela para outra ou preencher a tabela de um novo ambiente de desenvolvimento local com dados reais para testes. Como não é uma tarefa diária, nem sempre me lembro como faz, então resolvi juntar aqui o passo a passo até pra facilitar nas próximas vezes e talvez possa também ajudar alguém. Antes de poder restaurar algum backup, precisamos fazê-lo! O comando utilizado para isso é o pg_dump que já nos devolve um dump da tabela inteira – se quiser saber mais clique aqui para ler a documentação. No comando acima, extraímos todos os dados do banco (troque dbname pelo nome da sua tabela) e jogamos em um arquivo .sql. Pronto, já temos o backup salvo. Dica: esse é um jeito bem fácil de manter backup de seus bancos. Recomendo criar um comando que faça esse backup e utilizar o Cron para fazer isso automaticamente sempre. 1) o banco precisa existir com o mesmo nome do banco que foi extraído. 2) o banco não pode ter as tabelas criadas, senão vai dar conflito e a restauração não vai dar certo. Pronto, temos um banco restaurado! Para mim esse processo é fundamental em dois momentos: quando por algum motivo – normalmente tenso – eu preciso restaurar o banco em produção ou quando vou começar um novo ambiente de desenvolvimento e preciso de dados para testar o app e as mudanças que estou fazendo. Wow, how fast can 3 months go? 3 months ago I was extremely happy and anxious about how I was going to manage to become a web dev intern at a project I knew nothing about and to really work as a developer in a company that I admire since I’m an internet user. ✓ What is Taskcluster and how the AWS provisioner works (ok, there’s still a lot to learn here). ✓ What is an Azure entity and how to create one. ✓ How to run an application with no GUI interface and how to test things with Mocha – and accept that some things we just can’t see, but they work! ✓ How to build a React app – I didn’t build it from scratch but I definitely learnt a lot here. ✓ Ask for help soon instead of wasting hours and hours stuck on a small issue (such as a typo). ✓ Receiving a lot of comments and critics in your PR can actually be a good thing and an opportunity to learn. ✓ Not be afraid of making mistakes and make stupid questions – there’s no such thing as a stupid question. ✓ How to work in a completely remote team and actually be very productive. ✓ Got so many great tips from powerful women with the Women in Tech series sessions (thanks to everyone involved to make this happen). Beyond all the technical and professional things, I also had a lot of fun! I had the opportunity to go to London and have the experience of what if feels like to be a Mozillian. I met so many awesome people on this path that I can only say thank you! Mostly thanks to Dustin, an awesome person who I had the privilege of having as my mentor during this period. Thank you, Dustin, for teaching me so much in so little time! For being a great career advisor, for pushing me when I wasn’t confident about myself and for being a friend. Selena, you became a role model for me! I’m lucky I had the chance to meet you and to have you as our team leader. Kristel, it was awesome to meet you and share my challenges and frustrations with you, you are a very strong person, I hope you the best, always. Wander, always ready to help me when I didn’t wake up in a good relationship with English words, I’m glad to call you a friend now, for sure we are going to meet a lot here in Brazil. Thanks, John and Eli for the code reviews – I learnt a lot with them. Andrea and Hassan, it was nice to meet you in London, we had a great time! Greg, I wish you the best on your new role on the team, you are already doing a great job! Pete, Jonas and Brian, unfortunately, we didn’t have the chance to work much together but I could see how much effort and dedication you all put on Taskcluster, it’s really inspiring! Thank you, Taskcluster team, it was a pleasure to work with you all. Such a passionate and highly skilled team. I learnt a lot with all of you! PS. : If you are reading this and intend to apply to Outreachy, please do it, you won’t regret it! Feel free to ask for help or tips at anarutecvm at gmail dot com. After finishing the first version of the AMI sets entity, now we need to be able to manage them. Taskcluster has already a set of tools to manage its components and elements: the taskcluster tools. In order to manage the AMI sets it was natural to build a tool for that. At first, our main goal is to build a minimal tool that allows us to list all the AMI sets known to the AWS provisioner and to add, edit and delete AMI sets. The ideal way to manage this is to allow the user to edit each field separately and check if the AMIs are valid automatically, but for now we are editing it as a JSON object since the back end already checks if the data is valid. My first step was to build the add amiSet function – after all, without amiSets I cannot test any other endpoint. I started to see progress when apparently no errors showed up when trying to add an amiSet, but to check if it really worked I needed the listing function, then the view function. After making this work, edit and delete were the final ones. A first version is already being reviewed and hopefully it will be published soon. We still have a lot of improvements to make but it seems good enough to move forward and start to incorporate the amiSets in the AWS provisioner architecture. Even after testing the AMI sets entity endpoints in the back end, I wasn’t sure if it was really working because I could only see that it passed the tests that I have built, but I couldn’t really see the amiSets (and I must say I’m a very visual person) but now with the tool I finally can see them, and it is grateful to see that what you’re doing is working! – until it breaks something, of course. Taskcluster is a complex and big project and I’m working on a specific part of it: where we manage the Amazon instances and Machine Images (AMIs). As I’ve mentioned in my last post, my job here starts by creating a new database entity called AMI set, which stores sets of AMIs keyed by region and virtualization type. My work during the last two weeks were to understand how the AWS provisioner project is organized and how to create a new entity. Since I was creating something I knew nothing about, start coding seems to be the hardest part because I have no references of things I’ve done before and I need to learn basically everything. A good advice for newbies would be to chop everything into the smallest parts we can (I think this fits for almost every job and area). Whether we have a list of objects or a straight mapping is something that you’ll have to pick. A list of objects is really nice because you can do really neat things with Array.prototype.map and Array.prototype.filter. A mapping is really nice because it’s easier to address the values and it is impossible to have duplicates. Error checking with the object will be easier, but the list of objects is more in line with what we do elsewhere in the provisioner and probably what I’d prefer to see. Here we can see more methods that we can do with Array.prototype. As explained above, probably we’ll go with the list of objects option. After creating the entity I started adding its create and delete endpoints. The hardest part this time was to understand the functions and specially if I was dealing with instances, classes or properties. The thing that made me learn the most were the comments Dustin and John made in my Pull Request. It is really helpful to know the things you are doing right or wrong and to know where to go from there. So an important advice here is to start sending patches as soon as possible and don’t fear making mistakes – they will happen anyway and we can only learn from them. This was my first week working for Mozilla as an Outreachy intern. The first challenge was to understand Mozilla’s culture and how to fit in. We had some meetings about how the program works and to get updates about TaskCluster, the project I’ll be working at for the next 3 months. Mozilla has an awesome structure to receive new employees and I felt very welcomed, but that also means a lot of information to process and organize, which includes how to communicate with a fully remote team, setting up accounts, organizing meetings schedule, entering email lists, using Mozilla tools, joining IRC channels, etc. TaskCluster is the task execution framework that supports Mozilla’s continuous integration and release processes. For me it took a while to understand what TaskCluster is and what it is used for, but the process of understanding it is giving me a lot of “ah-ha” moments, which is a great feeling that shows me that I’m already learning a lot. For those who want to learn more, this page says a bit more about TaskCluster. My job at TaskCluster: add robust AMI management to the TaskCluster AWS Provisioner. More details on bug #1265390. My first task: create AmiSet entity. AWS: Amazon Web Services. A suite of cloud computing services offered by Amazon. Its website brings a bunch of useful tutorials. Azure Table Storage: Microsoft Azure Table storage service. EC2: Amazon Elastic Compute Cloud. “It’s a web service that provides resizable compute capacity in the cloud”. Entity: in Azure context, “Tables store data as collections of entities. Entities are similar to rows. An entity has a primary key and a set of properties. A property is a name, typed-value pair, similar to a column.” TaskCluster team has built a wrapper that is used in the project: Azure Table Storage Entities. Now that everything is much clearer, let’s create AmiSet entity 🙂 – uptades next week! Muito longo; não li (ml; nl ou tl;dr tupiniquim): post pessoal sobre meu trajeto na computação e aprovação no programa Outreachy. Já sigo um tempo sem postar por aqui nem no dicas e toda semana fico pensando “putz, precisava voltar com o blog, preciso mandar email pro dicas”… mas sento no computador, enrolo, entro em mil vortexes pela internet e quando percebo já está tarde e não tenho mais tempo. Soa familiar? Infelizmente esse é um problema muito comum e não existe segredo – pelo menos não descobri ainda, se souber deixa nos comentários, por favor… É muito difícil achar motivação e foco, principalmente quando a gente já trabalha tanto e quer ficar fazendo nada nas horas vagas. Já li muitos conselhos, posts, livros sobre o assunto e sempre chego à conclusão que a solução mesmo é parar de pensar sobre fazer ou não ou quando começar e sentar a bunda na cadeira e começar o que você quer/tem que fazer. A gente costuma gastar muito tempo se dando desculpas do porquê não começar ao invés de gastar esse tempo fazendo o que tem que ser feito. Hoje voltei por ter uma novidade muito especial! Pra quem me acompanha desde o início do blog e para os meus amigos próximos, sabem que eu não sou desenvolvedora, embora trabalhe com desenvolvimento de sites desde 2008. Sempre fui mais designer, porém há uns 2~3 anos minha vontade de voltar a estudar computação (fiz curso técnico) tem aumentado. Do ano passado pra cá tive que me virar muito com a plataforma que usamos na Mupi, startup da qual sou co-fundadora, e por isso considero que subi alguns níveis na área. De todo modo, continuo com muitas lacunas teóricas e ainda não consigo me definir como desenvolvedora. Ok, tem um pouco de síndrome de impostora nisso, mas eu chego lá. Em março deste ano, decidi aplicar novamente para o programa Outreachy que tem o intuito de inserir mulheres na comunidade de software livre – eu já havia aplicado uma vez em 2013 e não tinha conseguido. Fiquei sabendo que as inscrições estavam abertas faltando 1 semana para encerrar (obrigada Mônica por ter me avisado <3) e corri pra me inscrever, já que o processo consiste em preencher a ficha de inscrição e contribuir com um patch pro projeto que eu queria entrar, ou seja, toma um certo tempo. Passada a correria, stress e tempo livre trabalhando nisso, quem entrou num projeto da Mozilla? Yo! Olha o meu nominho ali. Ser aprovada no Outreachy tem sido muito importante para eu perceber minha capacidade e comprovar que toda conquista é precedida de muito esforço e dedicação, mas é possível! E essa tem sido minha motivação para desprocrastinar. Fuçar no site do Outreachy projetos que fossem do meu interesse (eu me interessei por uns 4, mas é bom focar em 1 porque não há tempo para tentar todos). Entrar no canal IRC do projeto escolhido. Conversar com os mentores sobre possíveis bugs e patches para enviar e por onde começar. Configurar o ambiente de desenvolvimento local para trabalhar nos bugs -> eu tentei trabalhar em dois projetos e essa é a parte mais difícil e demorada, pois requer muito tempo para entender como o projeto funciona, instalar todos os requisitos do projeto e fazê-lo rodar como deveria na sua máquina. Subir o patch do bug resolvido. -> aqui é importante ter um pouco de familiaridade com git, se você não tem, sugiro começar agora, dá uma olhada nesse curso gratuito do Willian Justen. Recomendo super! Para vocês veram o tipo de patch que é pedido, eu enviei 2 pull requests (esse e esse) e mandei um pequeno fix para um outro projeto da Mozilla. Todas as pessoas com quem conversei da Mozilla foram super receptivas e atenciosas, então não tenha medo de fazer perguntas, nenhuma pergunta é idiota. Mas claro, recomendo você sempre tentar resolver as coisas antes e fazer as perguntas à medida em que ficar bloqueada e não o contrário, perguntar antes de tentar. Bem, próximos passos: dia 23/05 começa o programa e aí que meu trabalho começa de fato. Pretendo continuar compartilhando meu processo e aprendizado por aqui, quem sabe não ajuda mais pessoas a se movimentarem e a deixarem de procrastinar um pouco? Além de incentivar mais meninas a virarem desenvolvedoras e se aventurarem no mundo do software livre. Existem várias formas de se fazer isso. Você pode, por exemplo, gravar sua tela em video e depois editar exportando para gif (o Adobe Premiere faz isso, Camtasia também, e existem alguns programas só para este fim). Mas como uso Linux, precisei aprender como fazer isso sem esses programas que só rodam no Windows ou Mac OS, e encontrei o Byzanz, que você pode ver seu código aqui. O Byzanz permite gravar a tela diretamente em um gif animado. Como não encontrei muitas informações sobre ele (parece que seu site está fora do ar), resolvi criar esse tutorial para ensinar como utilizá-lo, já que o achei super simples e soluciona muito bem essa necessidade. 1 – Instalar o Byzanz Abra o seu terminal e execute os passos abaixo para instalar o Byzanz. Esse passo é mais uma dica, ele não é necessário. Mas através do Wmctrl (um comando que permite você gerenciar suas janelas) a gente consegue experimentar tamanhos e posicionamentos de janelas para definir a área a ser gravada antes de usar o Byzanz. Se não achar o Wmctrl, leia este tutorial. 3 – Definindo o tamanho da janela que você quer gravar. Com o Wmctrl fica bem mais fácil essa etapa, por isso o passo dois. A linha abaixo está dizendo para posicionar a janela atual (no caso sua janela do terminal) se posicionar 500 pixels à direita (eixo x), 100 pixels abaixo (eixo y), com a largura (width) de 800 pixels e altura de 600 (altura) pixels. A opção -e significa que ele vai redimensionar a janela com os parâmetros definidos. Com os valores de tela definido, você posiciona a janela que vai ser gravada, seu navegador por exemplo, no local que ficou sua janela do terminal do passo três. E seu gif está pronto! Simples, não? Eu particularmente achei muito melhor do que depender de editores de videos pesados que demoram pra renderizar e são difíceis de mexer. Agora é experimentar, boas gravações! Ah, e se for gravar pra web só cuidado com o tamanho final dos gifs, afinal cada frame é uma imagem que podem custar caro pra sua performance. Uma das etapas mais fundamentais durante o processo de desenvolvimento de um produto, no nosso caso, web sites ou aplicativos, é a geração de ideias e protótipos. Após compreender o problema que temos que resolver, independente de sua complexidade, é necessário gerar ideias de como será sua solução para então poder implementá-la. Existem várias formas de representar uma ideia e projetar sua solução. O artigo abaixo explica a diferença entre mockups, wireframes e protótipos e é uma tradução livre que fiz do post feito por Marcin Treder no Design Modo. O original pode ser lido aqui. “Alguns anos atrás me dei conta de que muitos amigos meus de TI, não-designers, usam nomenclaturas de design deliberadamente como se fossem sinônimos. Eles assumem que wireframes, protótipos e mockups são exatamente a mesma coisa – um rascunho meio cinza, com várias formas retangulares que representam uma ideia engenhosa. O problema com essa visão simplificada é que eles nunca sabem o que esperar do trabalho de um designer de User Experience e muitas vezes ficam confusos. “Por que raios isso não é clicável?”, “Bem, eu não sabia que eu deveria clicar aqui…” – esses são comentários típicos em projetos de UX. Confundir wireframes com protótipos é como assumir que uma planta de uma casa e aquelas casas modelo decoradas para amostra são a mesma coisa. Embora você provavelmente queira morar numa casa modelo (você sabe, ela é bonita e supostamente mostra o quão legais são as casas na região), você não pode contar com uma estadia confortável numa planta de imóvel – é apenas uma folha de papel. A mesma distinção pode ser feita com wireframes, protótipos e mockups. Eles aparentam diferente, comunicam algo diferente e servem para propósitos diferentes. Porém, uma casa modelo e uma planta tem uma coisa em comum: as duas são representações do produto final – uma casa real. E novamente, o mesmo tratamento pode ser aplicado aos wireframes, protótipos e mockups: todos eles são formas de representação do produto final. Acredite ou não, a diferença entre um protótipo, um wireframe e um mockup é sempre uma das primeiras coisas que tento ensinar aos membros do meu time de design de UX. Sim, esse assunto é realmente importante. Vamos discutir wireframes, protótipos e mockups em detalhe, assim você poderá entender em quais situações utilizar cada um. 1. O que é um wireframe? Wireframes não são apenas caixas meio sem sentido desenhadas em p&b, embora pareçam exatamente isso. Considere-os como o esqueleto do seu design e lembre-se que os wireframes devem conter a representação de todas as partes importantes do produto final. “Representação” é um termo crucial aqui, que te ajuda a encontrar a fidelidade certa – e equilíbrio de velocidade de desenvolvimento. Você não pode mergulhar em muitos detalhes, mas, por outro lado, você precisa criar uma representação sólida do produto final que não sentirá falta de nenhuma parte importante. Você está definindo um caminho para todo o projeto e para as pessoas com quem você trabalha (desenvolvedores, designers gráficos, redatores, gestores de projetos – todos eles precisam de wireframes bem-feitos). Na verdade você está criando o mapa de uma cidade. Cada rua é representada no mapa, porém de uma forma bastante simplificada. Você consegue sentir a arquitetura da cidade ao olhar um mapa, mas não pode ver sua beleza. Wireframes devem ser criados num espaço de tempo curto: a maior parte do tempo deve ser gasta na comunicação com seus colegas e… pensando. A simples atividade de criar o wireframe deve ser realmente muito rápida. A visualização de um wireframe se dá esteticamente, mas de uma forma bastante simplificada. Preto e branco são as cores típicas que você irá usar (você pode adicionar o azul para especificar os links). Se algumas escolhas tomarem bastante tempo (por exemplo a escolha de ícones, subir imagens), você deve representá-las de uma forma primária (ex. utilizando espaços reservados para certos elementos – retângulos vazios com um “X” no meio para imagens acompanhados de uma descrição). Nós costumamos chamar wireframes de “entregáveis de baixa fidelidade” (lo-fi). Lembre-se: um wireframe bem-feito deve comunicar o design de uma maneira cristalina e definir o caminho a ser seguido por todo o time. Wireframes normalmente são utilizados como parte da documentação de um projeto. Como eles são estáticos e congelam a interação em um ponto específico no tempo, eles devem ser acompanhados de descrições por escrito (de pequenas anotações explicando as interações até documentações técnicas mais complexas, quando necessário). No entanto, eles também podem ser utilizados em situações mais informais. Já que são simples e rápidos de serem feitos, servem também como rascunhos claros para serem usados na comunicação interna do time. Se os desenvolvedores perguntarem como algo deve ser feito, a resposta pode ser dada com a criação rápida de um wireframe. Considere isso: a UXPin é uma start-up com ciclos de desenvolvimentos realmente rápidos (releases a cada dois dias). Nós utilizamos wireframes para a visualização rápida de tarefas (até as pequenas!). Isso elimina desentendimentos e é realmente barato. Wireframes são dificilmente utilizados como material de teste, ainda que possam ajudar a coletar feedback inicial, estilo guerrilha; ou como uma pesquisa na qual você não se importe muito sobre metodologia, mas sim em conseguir rápidos insights. Wireframes inseridos no contexto do processo completo do design podem ser surpreendentemente eficazes e, ainda que nos últimos anos tenham ganhado má reputação, continuam indispensáveis na fase inicial de projetos complexos. 1. O que é um protótipo? Um protótipo é uma simulação da interação final entre o usuário e a interface. Pode não parecer exatamente com o produto final, mas deve ser bastante similar (definitivamente não é um coisa cinzenta e com cara de rascunho, como são os wireframes). As interações devem ser moldadas com cuidado e apresentar uma semelhança significante com a experiência que o usuário terá no produto final. A interdependência entre a interface e o funcionamento do backend é frequentemente omitida para reduzir custos e acelerar os ciclos de desenvolvimento. 2. Quando utilizar um protótipo. Protótipos são utilizados em seu máximo potencial nos testes de usuário. A simulação das interações finais geram um ótimo material para testar a usabilidade da interface antes do desenvolvimento iniciar de fato. Os protótipos normalmente não são a melhor forma de documentação, já que exigem do “leitor” um certo esforço para entender a interface. Por outro lado, um protótipo é a forma mais engajante de documentação do design, uma vez que a interface é palpável e direta. Lembre-se que criar protótipos pode ser caro e consumir bastante tempo. Uma sugestão é criar protótipos que possam ser utilizados no desenvolvimento (sim, isso significa que você deve saber programar um pouco de HTML e CSS). Isso é especificamente eficaz em projetos relativamente simples. Feita de forma correta e combinada com testes de usuário, a criação de protótipos consegue pagar seu custo. 1. O que é um mockup? Mockups são muitas vezes confundidos com wireframes, por causa dos nomes de certas empresas de software. 2. Quando utilizar um mockup. Os mockups são particularmente úteis quando você quer vender a ideia do produto antes dele estar pronto para seu público estratégico (stakeholders). Graças a sua natureza visual, mockups não possuem a resistência dos entregáveis de baixa fidelidade (wireframes) e são bem mais rápidos de criar do que protótipos. Eles são ótimos coletores de feedback e, se inseridos no contexto geral do processo de criação do design, podem criar um bom capítulo da documentação. Isso é o mínimo. Agora pense qual entregável será mais apropriado para você. Considere seu produto e seu time. O que funcionará melhor para vocês? Uma documentação formal ou rascunhos mais informais e discussões presenciais? Você tem tempo e dinheiro para uma pesquisa mais consistente de usabilidade ou vai apenas a um café local desenhar alguns rascunhos a mão para os seus futuros clientes? Quais habilidades você possui? Você sabe programar? Olhar para si mesmo(a), seu time e seu projeto deve lhe guiar pelo processo de escolher o melhor entregável. Preciso modificar um commit passado, como faz? Antes de iniciar, você precisa copiar um pedaço inicial do hash do commit que você deseja modificar. O hash é o código de identificação do commit, exemplo: 636bf2643e67bf34f67691333b916e292571a469. No caso os 6 primeiros caracteres já são suficientes. Você pode achar o hash com o comando git log. Agora é só salvar e voi lá! o “fake” commit é fundido no commit de cima =) é só dar um checada se deu tudo certo com git log. UPDATE: Como pode se ver na primeira imagem, existem outras opções bem interessantes para se usar no rebase interativo, como o reword, que permite modificar apenas a mensagem de algum commit, e o squash que permite juntar dois ou mais commits em um só. Para quem lê em inglês, sugiro este artigo do github a respeito e dou um quote de alerta (tradução livre minha): “É considerada uma má prática dar rebase em commits que já foram submetidos ao repositório remoto. Ao fazer isso, você poderá invocar a ira dos deuses do git”. obs. 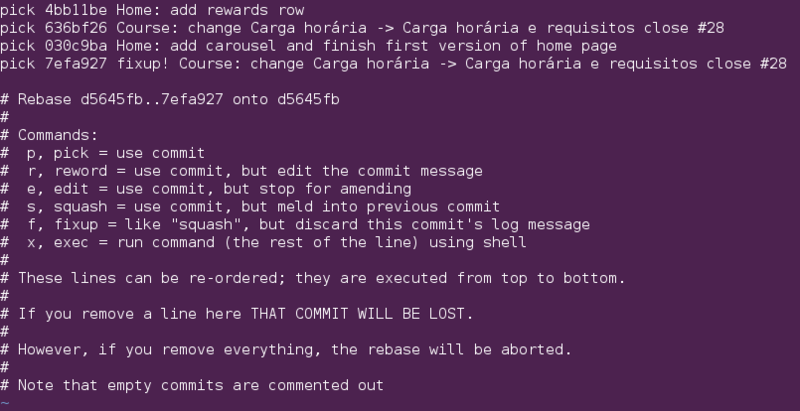 : Para modificar o último commit feito, git commit --amend é a melhor opção, já que “reabre” o último commit para edição.